I am trying to import a character into Unity from Blender. I exported the model (which has actions/animations) from Blender as a FBX file and dropped in into my Unity project’s Assets folder. The model with all of its components (mesh, armature, animations) appears in the project window; however, Unity doesn’t immediate associate the animations with the model when I drag an instance of the model into my scene. I have also imported a Blender default model (“Constructor” - a man with red overalls and a wrench), and have been comparing the settings of my model to the Blender model in order to find discrepancies. 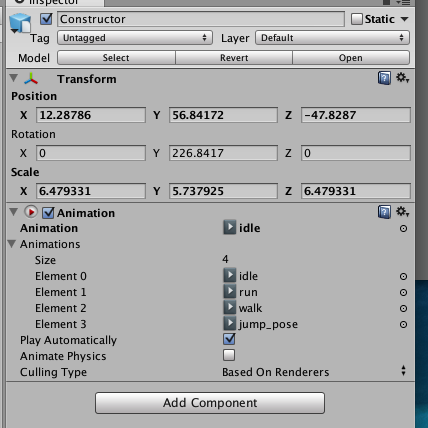 Blender’s model is automatically assigned an “Animation” window in the Inspector panel (image #1), while mine is assigned an “Animator” window (image #2). Since the former window is the one where the animations are listed and you assign the default animation, it seems like this one is crucial. How do I import my model such that the “Animation” window appears in its Inspector window? (I’ve tried adding an “Animation” window myself, but it doesn’t recognize the model’s animations as the Blender model’s “Animation” window does. 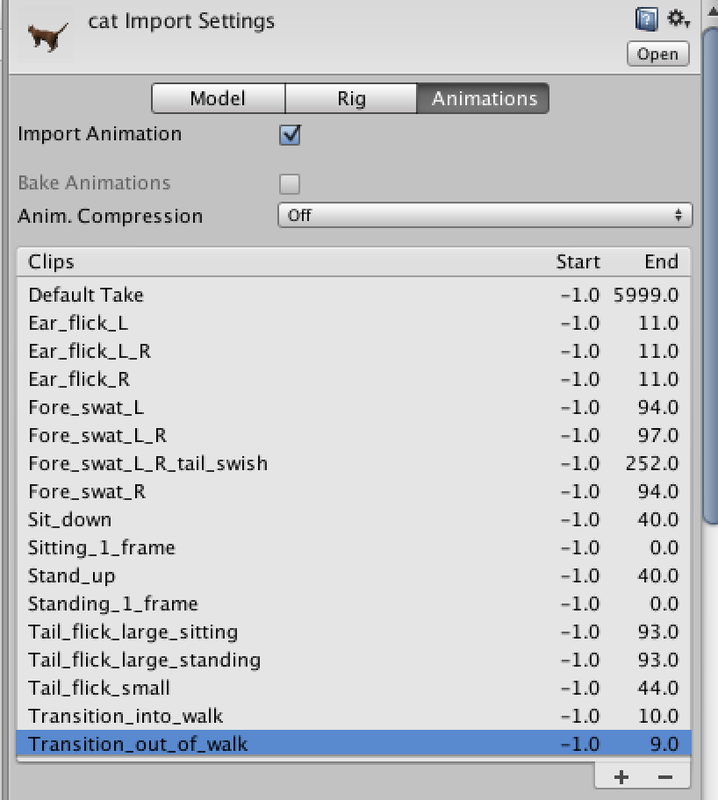 In Unity, my model’s animations all begin at -1.0 (even though they begin at keyframe 0 in Blender) (image #3). For each animation, I get the message, “The clip range is outside the range of the source take.” I get this message even when I move the animation forward several keyframes in Blender and re-export the file to Unity as a FBX. 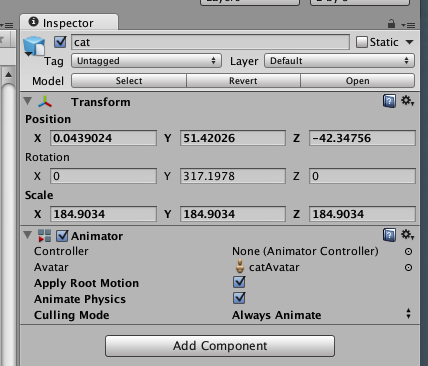 My actual question: How do I import my character into Unity such that it is automatically assigned an “Animation” window? I have been struggling with this issue for several hours now, and none of the online tutorials or forums seem to address it. I could make it a long answer but it would be a waste of time to write it, taking into consideration the fact that unity has made a great tutorial covering every step. Watch the Mecanim tutorial video I would have never figured out how it works before trying to figure it out yourself and asking on any website. It is just 20 min for what you are asking, don't quit. Not the answer you're looking for? Browse other questions tagged unity blender or ask your own question.